Baby: An eggplant (or aubergine, for our classy European friends). While I’ve never been a fan of eggplant, the colour is gorgeous, so we’ll stick with that for this week. That said, Grub is apparently 30cm (a foot!) from head to toe, which seems like a big eggplant! What I’m cooking: Her hearing is picking up this week, and apparently she can be startled by loud noises. I can definitely notice the difference when Mr Nester is talking to Grub, as she starts to wiggle much more! She’s already a Daddy’s girl…oh dear! Main symptom: No time for symptoms this week – it’s been about Mr Nester and his recovery, not really about me. That said, I’ve been pretty worn out this week, but I think that’s more to do with what’s been going on rather than a particular stage of pregnancy. 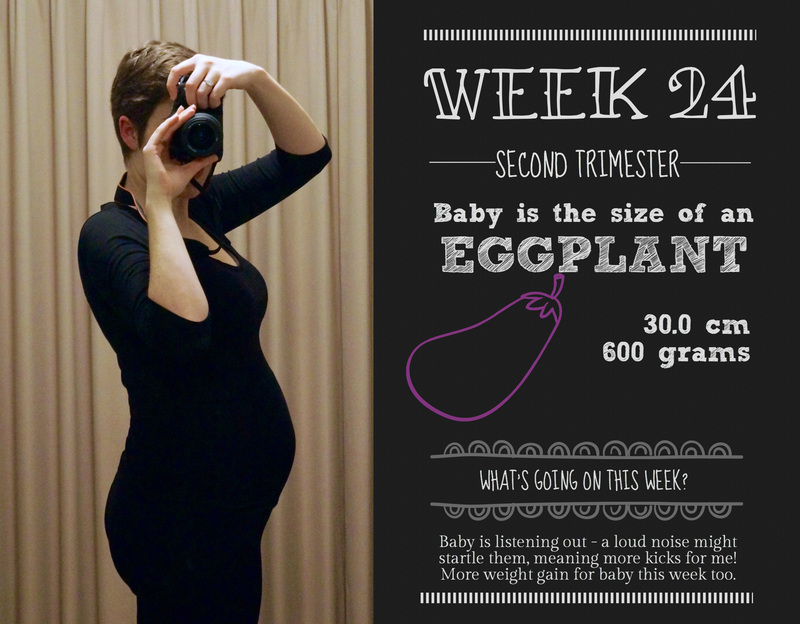 What’s on this week: We’re approaching the end of the second trimester, which can only mean one thing – more weight gain each week and not long now until we see our lovely Miss Grub for real! This week has been more of the hectic same, with Mr Nester coming home (yay! ), taking a couple of days off to look after my lovely patient, trying to stay up to date with work, and fighting off that feeling of everything just being a bit too much. This has culminated in me getting sick – seems to now be the standard response from my body when I’m doing too much. So this weekend has basically consisted of Mr Nester and I laid up in bed, sleeping, dozing, napping, other sleep related terms. I’ve been a great big ball of snot since Friday (sorry), and Mr Nester is still finding his feet while healing and trying to get his energy back. I’m finding that as each week passes where I’m distracted by other elements of day to day life, I’m feeling less and less prepared for the impending arrival of Miss Grub. I think part of this has been not being able to attend the birth class I had booked in, and partly because I’m not really sure what I need to do to get ready. I’m someone who likes to be fully prepared for upcoming situations, but there is so much in the way of “yes you need this”, “no you definitely don’t need that”, “don’t buy anything, you’ll get it at the baby shower”, “buy everything, you need to make sure you get the right stuff” – it’s all a bit much really. I also have numerous friends promising me some great second hand stuff, and one lovely workmate who basically filled my car with accoutrements from her daughter’s birth a couple of years ago. Again, I don’t know whether I’ll use everything I’ve been given, but I don’t want to turn anything down just in case it proves to be completely vital. Basically, I’m becoming a baby stuff hoarder. I don’t think it’s going to improve any time soon, either. Speaking of being prepared (or the opposite of), one of the women in my forum group, who went through IVF at the same time as me, has just gone into labour with her twins. They were born yesterday, at 25 weeks and 5 days. They’re tiny, but doing well. I’m so glad for her that everything worked out, but it scares me silly thinking that it might happen to me – I’m nowhere near ready! I have 15 weeks left! I guess it shows though that no matter what the circumstances, you just end up getting on with it. You deal, and cope, and survive, because of course you have to, and I’m sure everything will fall into place in time. It reminds me a little of Mr Nester’s diagnosis last year – it completely blindsided us, and for about two weeks we were in complete shock, and ran through the gamut of emotions, mainly fear. After that, however, we just sort of got on with it. You work out what needs to be done, you speak to professionals, and life returns to some semblance of normality (with a large influx of medical chat). I figure if we can get through the last 12 months unscathed, we should be able to handle the birth of our daughter. I guess we’ll see in about 3 1/2 months! I’m off to see the midwife again next week, which I’m looking forward to, as I wasn’t all that enamoured with the obstetrician at the last visit. I’m hoping for another lovely midwife to treat me like a real person, and hopefully give me some information on the glucose test, which should be coming up pretty soon.